I had a friend the other day ask me about how I did my tattoo for Envy from FullMetal Alchemist and I thought I would share with you all how I did it!! I purchased Silhouette Temporary Tattoo Paper from Amazon.com. They sell a normal one (2 sheets) and then a double pack (4 sheets). 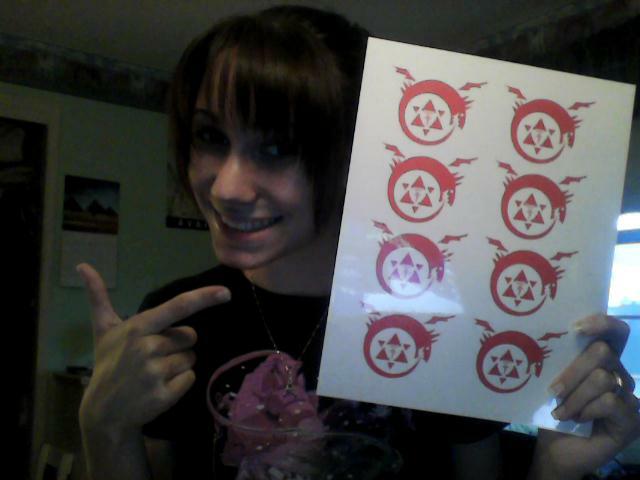 They come with the printable sheet as well as the adhesive sheet. MAKE SURE YOU PRINT YOUR IMAGE IN REVERSE SO THAT WHEN YOU APPLY IT TO YOURSELF, IT COMES OUT IN THE CORRECT DIRECTION!!!! Here are instructions on how to use the Silhouette Tattoo Paper. The tattoos last upwards to two days and are relatively easy to remove! Though, when you remove them, there is a bit of sticky residue that is a little annoying to get off and then things stick to your skin, so make sure you scrub well!! I hope this helps for any of you who need to do tattoos for cosplay without having to worry about spending hours at the con drawing them on or worry about them getting onto clothing or other people! !